With the coming of the railroad in 1855 it became apparent that the Main Street bridge and the Cady Street bridge were neither adequate nor properly located to handle the traffic from west of the river to the depot. What was needed was a by-pass, as it were. But it took 33 years for any action to be taken. 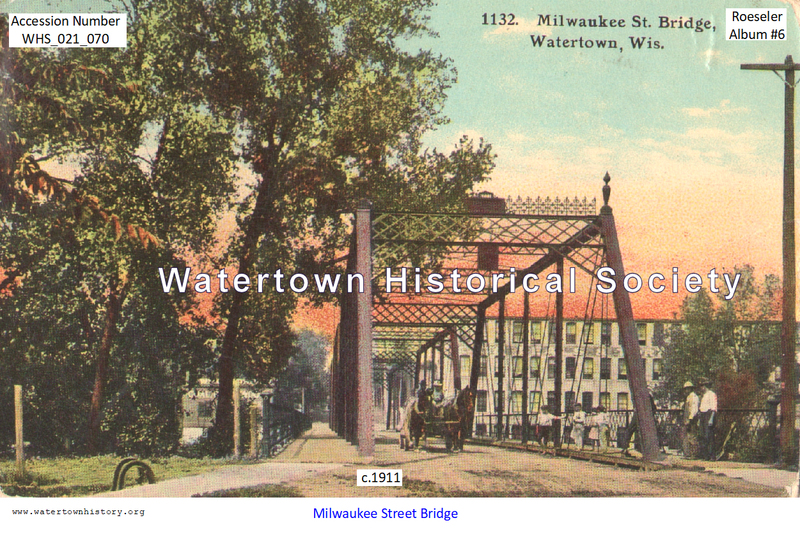 In July, 1888, the city council resolved to build another bridge, this one connecting Milwaukee Street on the east side with Spring Street on the west side (name of street before West Spring Street being renamed West Milwaukee) and the committee on streets and bridges was instructed to procure plans and specifications for an iron bridge as well as for an arched stone bridge. The new bridge proved a boon for the townspeople and farmers from west of the river. No longer was it necessary for heavily loaded wagons to travel through the business section of town, with its notoriously muddy streets, on their way to the elevators, which were now much more accessible. The disappointment of not having the use of a bridge at the foot of Western Avenue was alleviated. The Jefferson County board of supervisors showed their appreciation for the convenience seven months after the bridge was opened to traffic by appropriating $300 for the purpose of improving the approaches to the new bridge.